This is a fanboy. 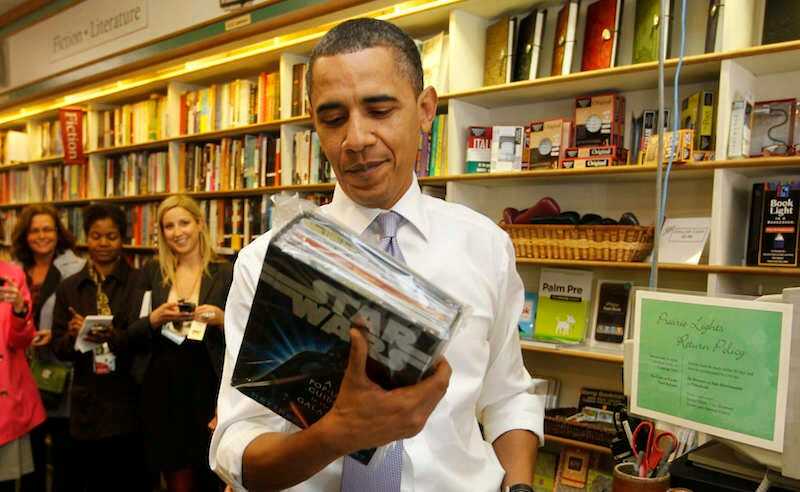 The leader of the free world, yes, but also a fanboy, who’s freaking out because he’s hanging out with Uhura. I have zero doubt the man knows more science fiction than he’s letting on. He’s absolutely got more movies and TV series he considers essential. Hell, he probably prefers Empire Strikes Back over A New Hope, too. And that’s fine! Come on, Obama. What are you hiding? Alien? The Prisoner? Terry Gilliam’s Brazil? Forbidden Planet? The new Battlestar Galactica series? What are you hiding, and why are you hiding it? Is it something genuinely shameful, like you’re actually a big fan of Enterprise, or the 1998 Lost in Space movie? Do you have a big Jupiter Rising poster in the Oval Office? Is that the problem? Look, if there’s ever been a good time for you to throw a few scifi skeletons out of your closet, this is it. The nerdy people have a right to know!